OK SUPERTRANS AD continues its policy of facilitating customers to call a taxi. The company has launched a program to place a digital button on different locations. A number of luxury hotels in Sofia have already benefited from the new service. The button is a tablet that is positioned at a given address and can be used by anyone on its screen application. The call does not go through the dispatch centre, but it goes directly to the cars that are close to the address. The application then “reports” after how many minutes the taxi will arrive, the car number and model. The innovation is extremely comfortable for positioning in hotels, restaurants, business centres, and public buildings. 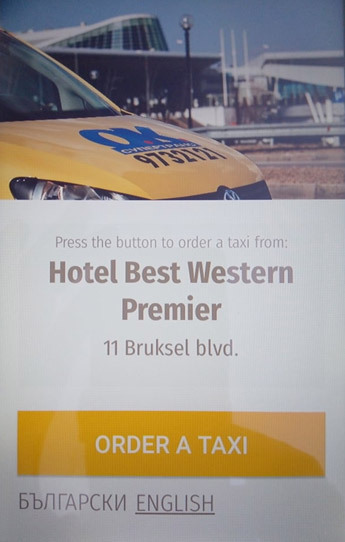 To get acquainted with the digital button or to order its programming for your business address, write to marketing@oktaxi.net.